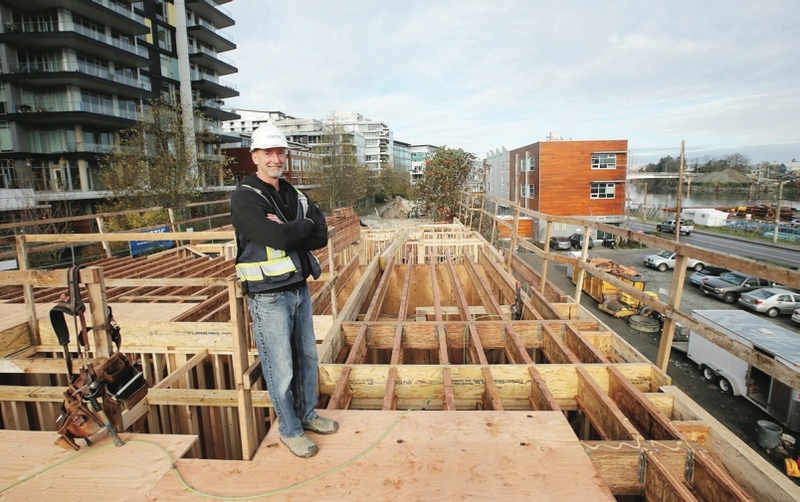 Article: How a construction crew gets the job done, starting at 6:15 a.m.
On December 5, Carla Wilson at Victoria’s Times Colonist daily newspaper wrote an article that vividly describes the activity on a construction site, early in the morning. Superintendent Ron Krachenfels at the Catalyst Community Developments projects for low-income housing, being built by Kinetic Construction. Construction workers have finished their morning coffee and are hard at work before many of us are even out of bed. 6:15 a.m.: Superintendent Ron Krachenfels arrives at Kinetic Construction’s site at Dockside Green. It’s dark out. The temperature is about four degrees. Today, thankfully, it isn’t raining. Krachenfels, a 1992 Camosun College carpentry graduate, heads to his on-site office, fires up the computer, turns on the lights, checks for any new information from the past weekend, and gets organized for the day. It’s quiet this early in the morning. 6:45 a.m.: Dylan Berlis, 26, climbs out of his car parked on Harbour Road to prepare for his first day on this job. 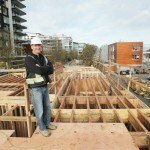 The Red Seal plumber and pipefitter is originally from Yellowknife. Berlis, who earned his credits at the Southern Alberta Institute of Technology, has been in Victoria for a year. 6:47 a.m.: A truck pulls up, carrying three framers from Alberta. They pile out of the car with coffees in hand. Everyone puts on helmets and high-visibility vests. They are already wearing steel-toed boots. A local shortage of carpenters brought them here. Part of an 11-member group, they’ve been working around B.C. He’s wearing a hoodie under his vest. If the weather cools, he has extra clothes with him. Another worker is keeping his head warm by pulling his hood up over his head. 7:00 a.m.: The plumbing company’s van pulls in. Arrangements are made to give plumbers a site orientation. 7:05 a.m.: The sky is brightening. The workers are at their jobs. 7:06 a.m.: Framers are on top of the first floor. They are setting up bright lights, inspecting work, measuring, discussing plans for the day’s work. Machinery starts to hum and a large orange forklift moves through the site. 7:09 a.m.: The workday is well in motion. Close to 30 workers will be on the job here this day. Work at the Catalyst project started in July and is expected to wrap up in July 2017, Krachenfels said. Construction is carried out on the site six days a week. Framers are working from 7 a.m. to 7 p.m. to get their work done as quickly as possible because they are from out of town and are renting two houses, Krachenfels said. By the time construction is finished at the Dockside Green site, close to 100 trades people will have worked on the location. These will include painters, landscapers, drywallers, mechanical workers and electricians. The same type of activity happens at other construction sites throughout the region. The value of building permits – which signal construction intentions – totalled $92.4 million in September. That’s up by 17.4 per cent from $78.7 million in the same month last year.